I wanted to do a quick update with some happy pub news, for two reasons. The first is that I very rarely get around to updating this blog, what with spending my spare time updating my London Pubology database website, not to mention the occasional time spent in an actual pub (such as last night, when I was with friends enjoying a Thornbridge Brewery tap takeover at The Craft Beer Co. Pentonville N1). The second reason is that we are often fed news stories about how many pubs are closing every year/month/week/minute; it always makes for doleful reading (though I’d question where some of those statistics are coming from in some of the stories). So I thought it might be nice to feature a former pub building that has been rescued from its alternative latter-day use and returned to us as a pub. Here it is five years ago, which as far as I’m aware is what it’s looked like since it closed around the start of the 1990s (when it was called The Stick of Rock) and until it reopened earlier this year. Figure 89. The Stick of Rock (Shoreditch E2), closed. And here it is earlier this month, with the original name (presumably) revealed and those ugly roller shutters removed, but otherwise much the same. Figure 90. 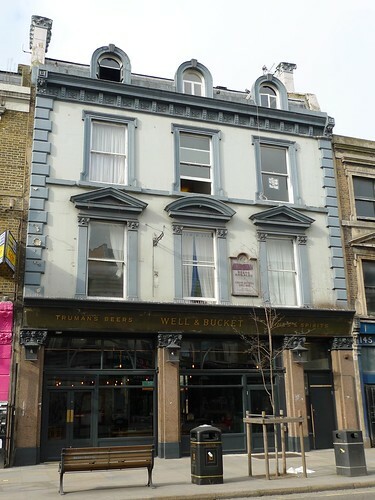 The Well and Bucket (Shoreditch E2). I would not of course be surprised if that’s just a replica of the original painted signage1 but it looks pretty good nonetheless. Inside, as is the modern custom, any internal divisions have been removed, the floor is stripped back to the boards, and what remains of the wall tiling has been retained and buffed up (photo of the interior). It’s very much a modern pub, but in an area where too many of these have been lost in favour of bars and clubs, it is, pleasingly, still a pub. So that’s a rare one for the other column of the ledger, pubs that have been found again. For example, they have a mock-up of an old-fashioned sign on the inside wall, though it seems that the company who made it specialises in such signs. There’s a similar one behind the bar in the above-mentioned Craft Beer Co. pub. 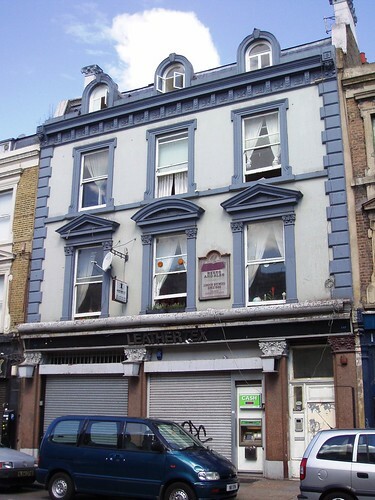 This entry was posted in Pub History and tagged e2, former pubs, reopened pubs, shoreditch. Bookmark the permalink. It links to your Flickr page.